My junk boxes (yes, that’s plural – I have several of them) contain a wide variety of electronic parts and gadgets that I have set aside because they are seldom or never used, or simply because there is no place for them in the room I call my ‘ Radio Shack ‘. Some of the things I have built function as planned, but are no longer used, and are kept because I can’t bring myself to destroy items into which I have invested so much time and effort. Some junk box items never worked as planned, and are regularly cannibalized for parts to be used in other projects. Some were just too cute to resist, sitting there in the “freebie” table at a Ham club meeting. Be that as it may, I plan to share some of the jewels found in my junk box(es) as I continue to find stuff during the never-ending sorting and organizing. Here’s a quick look at some of the things you’ll be seeing here in future postings . . . 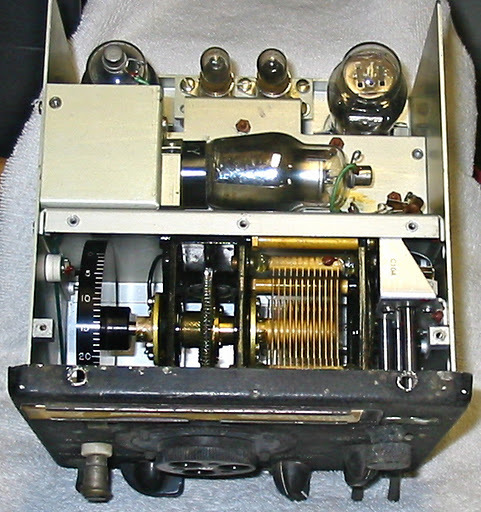 Antique / obsolete test equipment, such as the LM21 Frequency Meter pictured below. 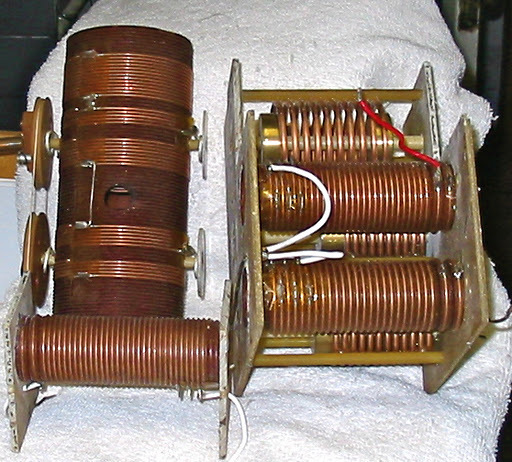 Individual parts and assemblies, such as the coil assembly shown here.
. . . and much more, as time and energy permit. They are high-voltage, vacuum capacitors that were once part of the military surplus AN/FRT-53 1KW transmitter output pi network. The 5 to 750 pF/3,000 volts capacitor on the right was the pi network tuning capacitor. 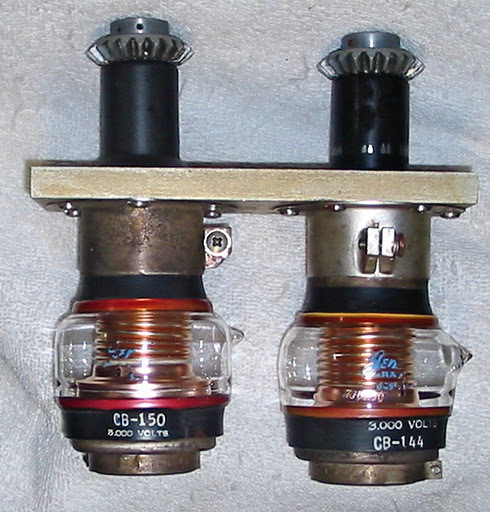 The 7 to 1,000 pF/25,000 volt capacitor on the left served as the output loading capacitor in the pi network. These capacitors were, of course, built to military specifications, and probably cost the taxpayers several thousand dollars, each. How did I happen to come into possession of these jewels? (One might ask.) Several years ago, I purchased the amplifier (minus the PL172-A final amplifier vacuum tube) at a reasonable price from a military surplus outlet, with the intention of getting a new tube for the amplifier and (finally) having a “full gallon” amplifier to boost my signals. Alas, I soon found that the PL172-A was very hard to find, and when a source was discovered, I also discovered that the price was prohibitive. So, I set the unusable amplifier aside for future consideration. After lugging the amplifier around through several moves, I decided to use parts from the amplifier to build an amplifier using readily available and reasonably priced tubes. I built the new amplifier using parts salvaged from the FTR-53, but for a variety of reasons, did not use the vacuum capacitors. The amplifier worked fine for a several months, then started having a variety of problems, and I was spending more time troubleshooting / repairing than using it, so it was relegated to the Junk Box. That’s how these fine vacuum capacitors ended up as the most valuable jewels in my junk box. Drop by again to find out what else I have found in my junk box. Hope to have additional posts ready, soon. This entry was posted in capacitor, coil, inductors, test equipment, vacuum capacitor and tagged cheap parts, Components, Electronics, ham radio, inductors, junk box jewels, vacuum capacitor. Bookmark the permalink.